If you or your spouse are a member of the military, you may be eligible to receive free tax return preparation for your federal tax return. The U.S. Armed Forces participate in the Volunteer Income Tax Assistance Program (VITA). Military-based VITA sites provide free tax advice, tax preparation, return filing and other tax assistance to military members and their families. The volunteers who provide assistance are trained to address military-specific tax issues, such as combat zone tax benefits and the new Earned Income Tax Credit guidelines. The Armed Forces Tax Council oversees the operation of the military tax programs worldwide, conducting outreach with the IRS to military personnel and their families. 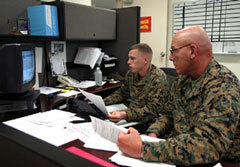 The AFTC consists of tax program coordinators for the Marine Corps, Air Force, Army, Navy and Coast Guard. Military commanders support the program by detailing members of the military to prepare returns and by providing space and equipment for tax centers. The IRS supports these efforts by providing tax software and training. If your filing status is Married Filing Jointly and you wish to file your tax return electronically, both you and your spouse should be present to sign the required forms. If it isn’t possible for both to be present, a valid power of attorney that allows tax preparation can be used to sign and file the return. There is a special exception to using a power of attorney for spouses in combat zones that permits the filing spouse to e-file a joint return with only a written statement setting forth that the other spouse is in a combat zone and is unable to sign. For more information, review IRS Publication 3, Armed Forces’ Tax Guide, available on the IRS Web site at IRS.gov, or order a free copy by calling 1-800-TAX-FORM (800-829-3676). For the genuine IRS Web site be sure to use .gov. Don't be confused by internet sites that end in .com, .net, .org or other designations instead of .gov. The address of the official IRS governmental Web site is www.irs.gov. Do You Need Tax Help? Educate yourself so you pay no more than your fair share of taxes. Special IRS information for Members of the Armed Forces. Armed Forces Tax Guide from the IRS. Are you taking all the deductions you've earned? Many of you operate home businesses, and you may not be aware of some of the deductions available to you. Check our Small Business Tax Deductions checklist. Return to top of Free Tax Help for Military Members.